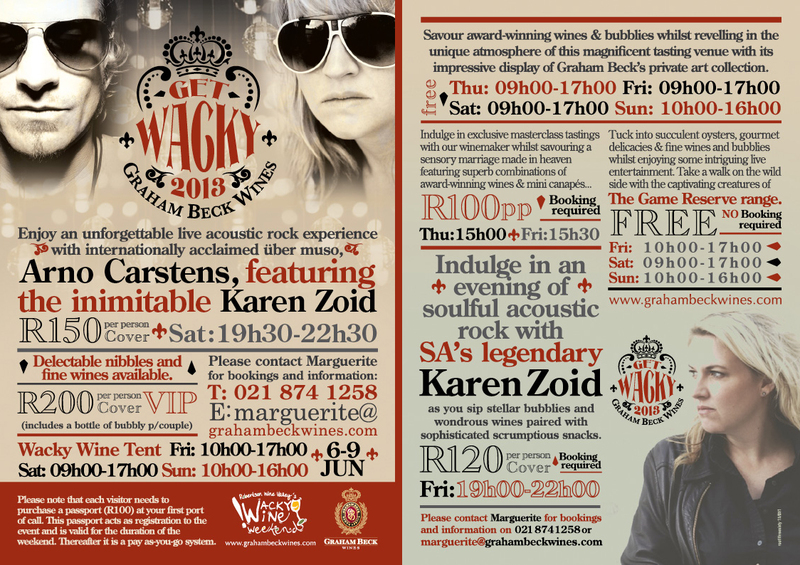 We hope to see you there on one of the days during the Wacky Wine Weekend & Graham Beck Wines in ROBERTSON!!! A roasted pear with Blue Cheese Starter. Followed with dishes known for the South African Fare. The tasting continues with: Bobotie with Blatjang, Bunny Chow, Rusks and Gatsby’s. (Chef will surprise you with some sort of sweet ending. Don’t miss this opportunity to meet a winemaker and enjoy the wine and foods from south africa! We are currently at 28 people and counting. It will be a fun night for sure. I recently came across a British writer’s article on New World sparkling wines, particularly those made in the traditional method. He wrote extensively and enthusiastically about USA, Australian, New Zealand and Latin American sparkling wines. South Africa was given a brief mention, but the South African section was more notable for what it did not say than what it did say. Included was the paragraph: “Production is very small scale with fewer than two-dozen producers”. I was surprised that a British wine buff knew so little about South African Cap Classique – surely a dynamic and exciting sector world-wide. I also felt my patriotic feathers slightly ruffled, and decided to do some digging around for more information in order to put the record straight. I contacted the author and he said he would really welcome additional details; he said that he had tried doing further research on South African Cap Classique himself, but had found information on South African Méthode Cap Classique (MCC) wines hard to come by. Cap Classique was established in 1992, well before the embargo was placed on Méthode Champenoise in 1995. At that stage, the CCA came into existence, having 14 members. The CCA now has 82 members in their producers’ association. This is by no means inclusive, and according to the Platter Wine Guide, approximately 100 South African wineries make Cap Classique. The CCA raison d’être is the promotion of South Africa’s premium MCC wines, as well as the promotion of the common interests of the producers of MCC wines. Cap Classique refers to bottle fermented sparkling wine made according to Méthode Cap Classique. Carbonated sparkling wine is mainly made by cooperatives and wholesalers. Pieter estimated there are fewer than three producers producing Charmat method (Cuvée Close) sparkling wine. These figures do not distinguish between sparkling wine and Cap Classique, and Pieter estimates that of the 15.4 million litres produced per annum, roughly 5.4 million litres would be Cap Classique wines and 10 million litres would be sparkling wine. The major MCC wines that are exported are Poncracz, Graham Beck, Simonsig, Pierre Jourdan and Villiera, and the main export markets are Sweden, UK, Germany and the USA. Total Cap Classique production per annum is approximately seven million bottles, and current sales suggest that this volume doubles every five years, making it an extremely exciting category in the South African wine industry. There are only a few really big producers (producing more than 200 000 bottles a year; two of these produce a million bottles a year). About six producers together produce nearly 80% of the sparkling wine produced in South Africa. Styles which are emerging are Blanc de Blancs, blends, Rosés and the small amounts of Prestige Cuvées. Any variety is permitted, and current legislation for the time spent on the lees is a minimum of nine months. There is currently a white paper in existence stipulating that the minimum time on the lees should be 12 months; it is anticipated that this law will be in force by the end of 2013. The CCA organises three festivals a year, as well as an annual base wine tasting workshop by their members, the goal of the workshop being the improvement of the quality of the base wines going into bottles. There is also an annual technical seminar, where international speakers discuss the latest products and technology, and this culminates in a Champagne tasting. The CCA is also committed to various social upliftment projects. At the Investec Johannesburg Bubbly Festival in 2011, it was decided that all profits made would be donated towards a project dedicated to assist children in the winelands who come from challenging and disadvantaged backgrounds. Likewise, all of the big MCC producers share a common objective of the cultural and educational upliftment of the local communities, particularly in the winelands. • In 1994, Graham Beck Brut NV was chosen as the celebratory drink at the presidential inauguration of Nelson Mandela. • After declaring his intention to run for president, Barack Obama took Michelle Obama to one of their favourite restaurants in Chicago. The sommelier recommended Graham Beck Brut NV, and the Obamas liked it so much that they ordered it for Barack Obama’s presidential inauguration in 2009. • Frans Malan, the founder of Simonsig, was the first producer of Méthode Champenoise in South Africa when he pioneered Cap Classique in 1971. In 1997, Kaapse Vonkel became the first Cap Classique to use all three of the classic grape varieties used in traditional method sparkling wines, when Pinot Meunier was introduced (the three being Chardonnay, Pinot Noir and Pinot Meunier). • The 11th Amorim Cork Méthode Cap Classique Challenge. Judging will be conducted on 28 August 2012, and the winners will be announced at the 12 Apostles Hotel and Spa in Cape Town on 20 September 2012. I hope that this goes some way towards putting the record straight, and I encourage the British author of the article on sparkling wines to try ours. Wouldn’t it be nice if one day, the French were to say of their Champagne – “Well, it’s like Cap Classique, but we are not allowed to call it that”! Boasting some of the country’s top Cap Classiques from estates such as Colmant, Graham Beck Wines, House of Krone, La Motte, Môreson, Pierre Jourdan, Poncracz, Simonsig, Silverthorne, Steenberg and Villiera, the festival will offer patrons the opportunity to sip and sample the finest of bubblies without having to venture into the Winelands. World-renowned Champagnes will be presented by brands such as Follet-Ramillon, Tribaut and Veuve Clicquot. The following wines have been selected to be shown in the Bastille VIP tent on Saturday 14th July and Sunday 15th July from 12-5pm in Franschhoek. Celebrate the last few days of summer in style and head off to Leopard’s Leap Vineyards on 31 March, set in the picturesque Franschhoek Wine Valley, for the inaugural Franschhoek Summer Wines. Known as one of SA’s leading wine destinations, some of the valley’s top wineries will be showcasing their finest summer wines at this exclusive event. include La Bri, Morena, Colmant, Môreson, Anthonij Rupert’s Cape of Good Hope and Terra del Capo, Franschhoek Cellars, Bellingham, Noble Hill, Leopard’s Leap, La Motte, Solms-Delta, Graham Beck, Haut Espoir and more. Wine lovers will have the opportunity to browse at their leisure or engage with the winemakers, who would have just finished the 2012 harvest. Relax and unwind, taking in the scenery of the valley as live entertainment ensures an unforgettable experience throughout the day. Taking full advantage of the glorious summer days the festival will be open from 12pm until 5pm at Leopards Leap Vineyards. Celebrity chef Liam Tomlin, who has recently launched Liam Tomlin Food at Leopard’s Leap Vineyards, and which has been receiving rave reviews, will ensure you don’t go hungry as he prepares sumptuous food to purchase whilst enjoying the day. Tickets cost R180 per person which includes a tasting of all the wines on show. Locals Special: R150 per person- these tickets have to be bought at the Franschhoek Wine Valley Offices. Booking is essential as tickets are limited to 350 people only. Those wishing to spend the night will be spoilt for choice with accommodation ranging from the finest bed and breakfasts to luxurious boutique hotels, all nestling in a picturesque and safe environment.